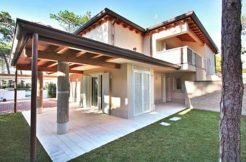 Description: This very exclusive sea-view-apartment with large covered balcony and terrace areas is in the first row to the sandy beach and the shimmering-blue sea, in the centre of Grado. The light-flooded and very tastefully furnished 5-room flat is located on the 3rd floor of a very well-maintained residential complex from the sixties with lift and private d parking space area. Beautiful apartment, just a few metres away from the sea and the beach!